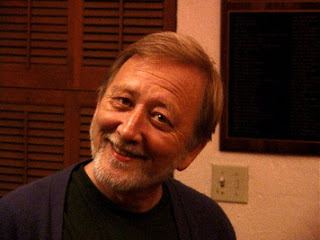 (Michael Litfin, this photo and others by Andrew Hayes). 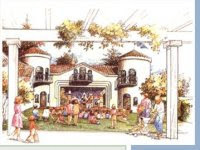 The Palo Alto Children's Theatre played a huge part in my life when I was young. In fact, I would say that many of the best memories of my childhood are from performing in shows and (later, during college) working backstage, building sets. Several of my coworkers continue to be among my very closest friends. About two months ago I heard the theater was the target of a financial investigation. Having had first-hand experience with Palo Alto's "Nothing Better To Do So Let's Go Harass Teenage Skateboarders" Police Department when I was a delinquent, I have my doubts about the merits of this investigation. But of course as a reporter, I know one can never be too cynical. Even more sadly, Michael Litfin, one of the theater's two directors, died of cancer while the investigation was still going on. Michael was a great person, and today they're celebrating his life at a ceremony at the theater's Secret Garden. That's the same place where I had my first kiss, and the place where my mother's memorial was held when she died, many years ago. It pains me deeply to miss Michael's ceremony. Rest in peace, Michael and thank you for everything you did for me _ and thousands of other kids. 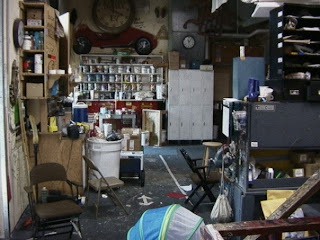 (The shop, which houses a little bit of my soul amid that blessed mess). Michael picked a hell of a time to quit smoking. I can joke, because I know that our sadness at his death and the confusion of the moment are of no matter, weighed against what he accomplished in life. That will become more clear in time. Everything does. To a delinquent teenager's eyes, more than 20 years ago, Michael cut a fearsome figure. I remember rehearsals grinding to a halt and being summoned onto center stage to face a stern-voiced man seated in the center of the auditorium. It was hard to see him, what with the lights in my eyes and all. "Was it you who threw the rubber chicken onto the set?" Dead silence of anywhere from 15-45 actual seconds. Time enough to wonder how much it would hurt to fling myself into the orchestra pit. "Did you have permission to take it from the prop table?" Another silence of up to a minute. Fantasies of sprinting through the emergency exit door and never looking back. Finally, offering apologies and receiving Michael's dispensation to slink back into the wings. Those uncomfortable silences were effective _ in retrospect, you couldn't ask for a better illustration of how to put dramatic tension to use. I shall torture my own children with the technique someday. Now that time has been getting on, I see Michael rather differently. I was 12 years old the summer my mother died of cancer, and Michael and Pat cast my little sisters and I as extras in a Wingspread production of "The Music Man." There were 15 or so surrogate mothers in the cast and crew. I see that now. Probably it wasn't pure talent that got us into the show. I see that now. I returned to the theater as a young adult with more appreciation for Michael's arch character. Anybody who witnessed him leap onto the stage during a rehearsal and physically demonstrate how to do a bit, knows such moments were as magical as they were rare. And his pre-show pep talks: "Ladies and gentlemen, you've got a *hot* show!" _ he outperformed us all. There are a lot of things I wish I knew about Michael. Gallows humor we shared, but I never found direct conversation with him easy, even after I hung up my black show slippers. Did he favor the presentational or representational school of acting? Did he even think in those terms? It came as a shock to me to learn that he grew up in Minnesota. I would have thought he just hardened sometime in the Precambrian. One thing I'm quite certain of is that I loved him, and am forever indebted to him and the rest of the theater staff. No. The importance of the theater to Palo Alto (and beyond) runs both broad and deep. Broad, as in the outreach program and the many kids who just pass through the theater once. The experience of having a real director and real set can't be compared _ with all respect _ to that offered by the typical elementary or high school production put on by an English teacher with a good heart. 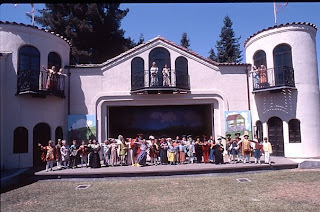 Just a thought in passing: how many kids in Palo Alto had their first crushes or kisses during a Children's Theater show? Deep for those kids _ many of them 'outsiders' at school _ whose lives are changed forever by discovering that they have an unexpected talent for theater or stagecraft. And also deep for those like me, who just plain loved it. So, Michael is irreplaceable, but he absolutely must be replaced; we will mourn and miss him badly, and the shows must go on. I understand he was really looking forward to his 25th birthday. Let this be the celebration. My 8-year-old son is a current denizen of the Children's Theatre, and my wife attended Michael's memorial today, which she said was a wonderful and very moving event, played to a packed house. It's heartening to know that people all over the world have been inspired by Michael Litfin; I mostly just wanted to write and let you know that your remarks were printed, in full, in the memory book that was distributed at the memorial.